CAREER HIGHLIGHTS: Electric vehicle maker Tesla, which he co-founded in 2003, is just one of the entrepreneur's successful ventures. In 2002 he co-founded Space Exploration Technologies, which is developing rockets and spacecraft for missions to Earth's orbit and other planets. Prior to SpaceX, he co-founded e-commerce company PayPal. Before that, he co-founded Zip2, a provider of Internet software to the media industry. REASON FOR WINNING:Musk has proved that he's capable of doing what seems impossible. 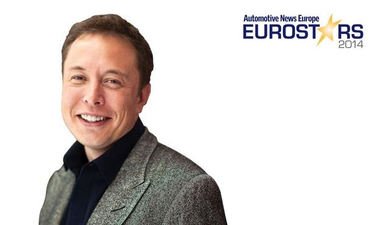 His 11-year-old Tesla Motors is the first automaker in the modern era to enter the ultra-competitive European auto market and immediately become a top player in a key niche. The Tesla Model S, which starts at 67,300 euros, was Europe's No. 2-selling electric vehicle in the first half, beating out the less-expensive BMW i3 (34,950 euros) by nearly 1,000 units. Yes, the i3 is a compact car and the Model S is a sedan, but when was the last time an infant car brand outsold a long-established auto brand in Europe? The answer is: never.